Lock in a great price for NH Ciudad de Zaragoza – rated 8.9 by recent guests! A hotel in a very good location and nice view of the river. As most NH hotels, it had good service and it was clean and bright. Location is really good too. I chose this hotel for its location & because it had on site parking... right across the street from Basilica de Nuestra Señora del Pilar The room was and the bed ans pillows were perfect... just like I like them. The Wifi was good & Breakfast was excellent as always with NH. Rooms were spotless. Beds extremely comfortable, plus light and spacious. Bathroom was big and had shower and bath. Our room looked out over the city and water. Breakfast was vast and perfect. So much choice. Staff were very efficient and friendly. Central location but quiet, soundproofed rooms. Once you have parked here you do not need the car. The location was great. A short walk from the main attractions in old town. Hotel clean and staff attentive. Perfect location Good breakfast and very helpful staff. I booked two rooms, one for my husband and I and one for his mother. Both rooms were clean, nice in size, and had great views of the basilica just across the street. The location was great. Worth the extra money for a room with view. The staff was friendly and helpful. It is not easy to find the parking garage, but we called and the woman who answered was very helpful and stayed on the phone with us until we figured it out. Hotel staff was outstanding. Hesitated to try breakfast due to price, but it was worth it and I recommend it. 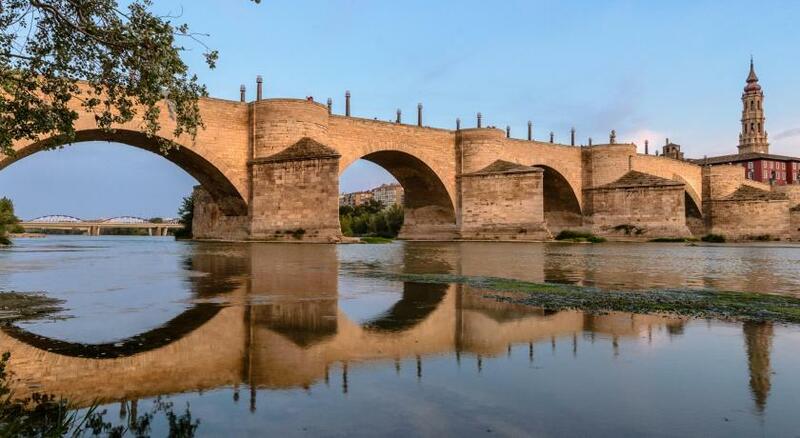 Location is ideal for anyone wanting to see and experience the history and art of Zaragoza. Good choice for a short trip to explore Zaragoza. Ideally located near cathedral yet accessible by car. All the comforts to be expected from nh-hotels. Helpful and friendly staff. NH Ciudad de Zaragoza This rating is a reflection of how the property compares to the industry standard when it comes to price, facilities and services available. It's based on a self-evaluation by the property. Use this rating to help choose your stay! 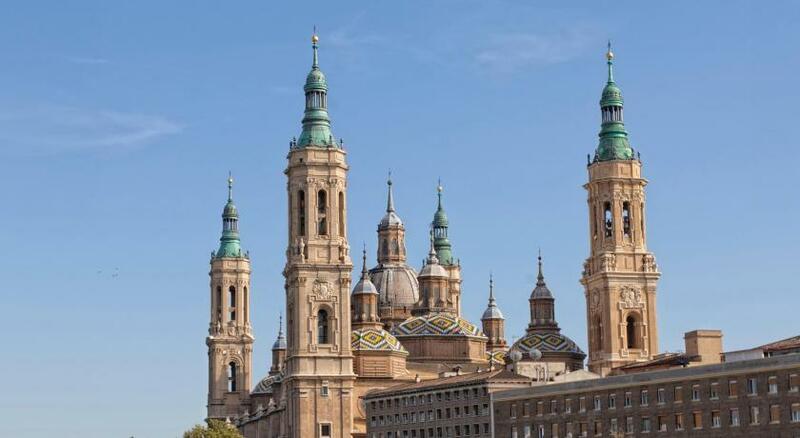 One of our top picks in Zaragoza.Set in Zaragoza’s historic center, NH Ciudad Zaragoza is 1,000 feet from the Basilica of Our Lady of the Pillar. It offers modern rooms, most with Basilica or River Ebro views. Each air-conditioned and heated room offers free Wi-Fi, a pillow menu, desk, satellite TV and mini-bar. The private bathrooms feature a bath or shower, hairdryer and free toiletries. The Ciudad de Zaragoza restaurant serves fresh market produce and is open from Monday to Saturday. A buffet breakfast is available and there is a café-bar and lounge. There are 3 meeting/banquet rooms and private parking is possible for an extra cost. Guests have free access to a gym. The hotel has direct access to the A-2 Motorway, and has good links to the train station, airport and Zaragoza Congress Center. There is a tram stop next to the hotel. The nearest airport is Zaragoza Airport, 8.1 mi from the hotel. This is our guests' favorite part of Zaragoza, according to independent reviews. When would you like to stay at NH Ciudad de Zaragoza? This air-conditioned room features a satellite TV, a private bathroom with bath or shower, and a mini-bar. It also comes with free Wi-Fi. Please note, this room cannot accommodate extra beds or cots. This interior, air-conditioned room features a small double bed, a satellite TV, a private bathroom with bath or shower, and a mini-bar. It also comes with free Wi-Fi. The hotel has a great location in the city’s historic center, 250 meters from Basilica of the Pilar and Zaragoza’s main shopping area, where you’ll find plenty of bars. Plus we’re on the banks of the River Ebro and there’s a promenade nearby that’s perfect for jogging. Two huge cathedrals, Basilica del Pilar and La Seo, tower above Zaragoza’s old town. Away from the basilica’s busy square, there are Roman ruins waiting to be uncovered, as well as stores and inviting cafés. House Rules NH Ciudad de Zaragoza takes special requests – add in the next step! NH Ciudad de Zaragoza accepts these cards and reserves the right to temporarily hold an amount prior to arrival. One of the most picturesque neighborhoods in Zaragoza! The air conditioning was not working, the hotel reception says they do not put it on until summer but it was very hot , a constant 25 degrees, they suggested opening the window bug that did not help....no reason to choose an air conditioned hotel if they do not operate it ...disappointed. Excellent location easy walking distance to everything. Really helpful person on the desk who gave us really good advice about what to see. The parking is kind of expensive (but no surprises here, we knew the price in advance) and is extremely small, so is quite hard to park (especially if you have a big car), still is reasonable knowing you're just in the perfect place within the city center (old town). So, perhaps not the cheapest option in town, but what to say... The hotel is perfectly located just in front of the main and most beautiful square of the city. The rooms are modern, cozy and comfortable, and the bathroom is clean and spacious. The staff is amazingly kind and available, they really make you feel pleased (which kind of surprised me being this such a big a hotel). And of course the cherry-on-top: an incredible amazing buffet breakfast! Totally worth the money! Could have replaced the coffee ,milk,toiletries more often during our stay. I can't think of anything I didn't like about the hotel. I would stay there again. The hotel was very well located, less then 5 minutes walking to the main square of Zaragoza. The room had an astonishing view over the river. It was big, confortable and very well equiped. Very friendly and smiling people ! Clean and quiet rooms. It's in the center of city, has good wifi connection, parking. In my next visit to Zaragoza, will be in NH ciudad de Zaragoza. the underground parking is quite tight and really expensive but could not detract from a wonderful overnight stay. great welcome , room overlooking the Rio Ebro and a wonderful meal in the evening (the taster menu is really good ) followed next morning to a huge array of foods for breakfast. Location was right in the center of town - it's right across Cathedral-Basilica of Our Lady of the Pillar. The staff were friendly and helpful! Room was clean, bed was comfortable, bathroom was immaculately clean. Not enough seating in the bar area and it looked as though Simone was holding a one on one tutorial for an extended period of time taking up valuable guest space - but that is me being Uber picky. I would certainly return to this hotel when it is summer. Forewarning thst the restaurant would be closed. It was freezing cold. We had a dog so finding a restaurant at night was difficult. We had to leave the dog in the room unattended. It was difficult to find the hotel. The restaurant was closed on both nights of our stay which was very annoying. The parking is difficult to access and small spaces. Lovely view of the basilica, central position of the hotel and a great breakfast buffet. Will certainly return.